In this charming tapestry by Charles Le Brun, we see children in the garden of an estate. The children are planting flowers in an enclosed garden arbor and tidying sticks and branches. The works of Le Brun became most influential as he became the First Painter to the King in 1664. Prominent ambassadors from around the world came to see his art works in the court of Louis XIV and LeBrun was named the Director of Gobelins. These Gobelins tapestry workshops employed over 250 workers and the works of Le Brun decorated the King's Palaces, the Louvre, Versailles, the Gallery of Apollo, the Tuileries and the king's carriage and ships. This piece, with its attention on composition and the use of abundant detail in the border, creates a captivating piece that is characteristic of each of Le Brun's creations. 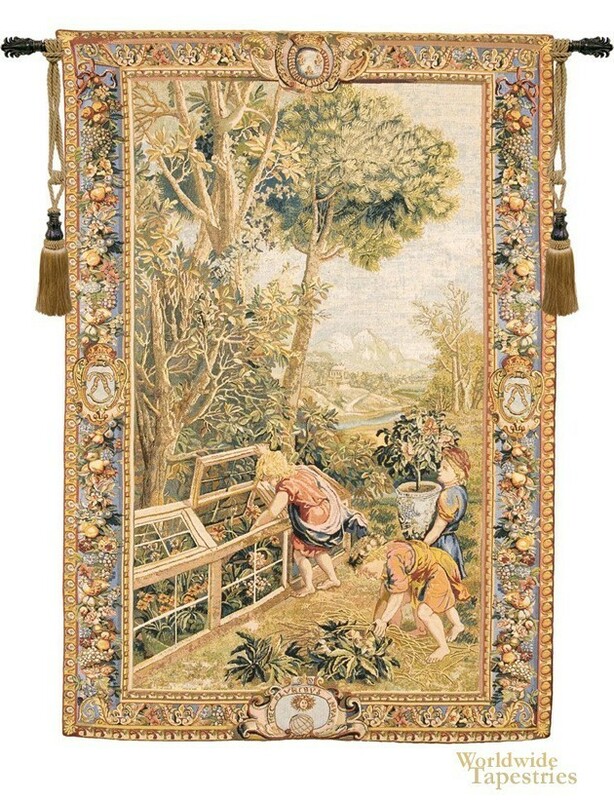 This beautiful art tapestry "Enfants Jardiniers" is backed with a lining and has a tunnel for easy hanging. Note: tapestry rod and tassels, if pictured, are not included. Dimensions: W 43" x H 66"